Tigh Tom was the home of our Uncle Alistair (Tom) and Aunty Annabel MacEachen. They built their home on the land of their ancestor Neil MacEachen (The French Macdonald). The house has been recently renovated and modernised. 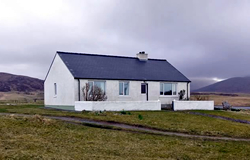 Set in a peaceful setting among the natural beauty of South Uist. Within walking distance there are sandy beaches, and near to the house there is a small loch, visited by swans, ducks and other wildlife. The house has oil fired heating throughout. We have an outhouse for fishing rods, outboard engines, cycles, canoes and wet coats. There is parking for four cars and bicycle hire is close by in the township of Howmore. The house has three rooms, one double and two twins, sleeping six. We have a cot and high chair. The shower room has a toilet and wash hand basin. The kitchen has a fridge, deepfreeze, electric cooker, dish washer, washer/dryer, and micro-wave. In the lounge, with it’s lovely views, there is satellite colour TV, DVD player and radio. Wi-Fi is included. This is a great location to enjoy the peace and tranquility of a different way of life. Golfing, bird watching, fishing (loch permits are available from South Uist Estate) and walking are what attracts many of our visitors back to the area. Bus services are available a short distance from the house. The Church of St Joseph is close by.